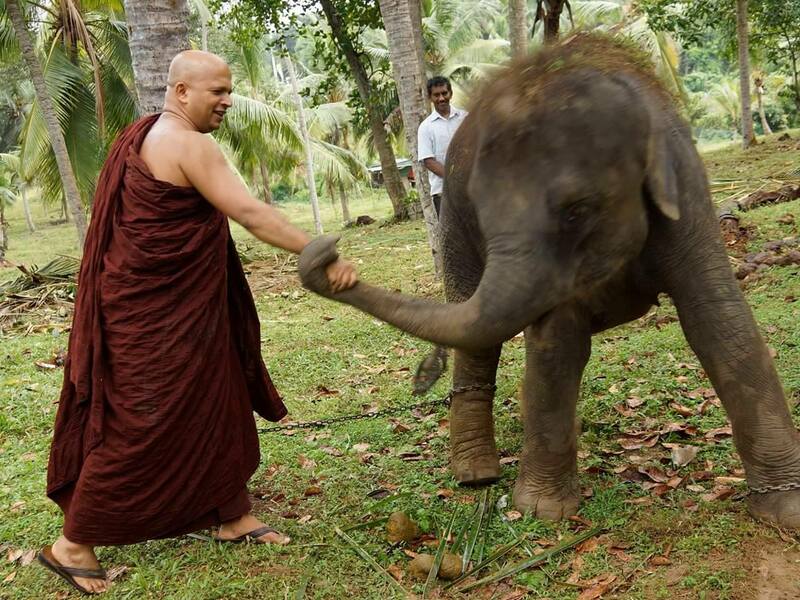 The Colombo High Court today granted permission to Buddhist Monk Uduwe Dhammaloka to travel to London for a Dhamma sermon at the Sri Saddhatissa International Buddhist Centre. Dhammaloka in his application to court, requested permission to travel to London from September 3 to 7, 2016. The court granted permission but ordered the monk to return his passport to the court on September 13, and appear for trial on September 20. The monk is currently out on bail for possessing a baby elephant without a valid license. He was initially arrested over the matter in June this year. HOpe not this abusive monk has his illeagal women in London ? He seems to be not seeing the truth about the current politics. We perfctly know what a regime we had prior to 08th Jan 2015. As if the monk is born today, he goes on saying that the kind of Investigation sagainst all the high culprits – if this monk is sane, he shoudl help follwoing late rev. monk Sobitha Hamuduruwo. I have no idea about the monk above, most I am known to are pinbath eating pinguthayaras. As some commentators describe it – they just hide behind the Sanga costumes but live up their fantasies as they think is right. With sky high cost of living, the life is becoming no easy to the average – but no care, as i lately got to see in Kelaniya temple the manner some young Sangayas were busy with their Face Book posts while others go behind them to greet them – was a really abusive picture. No matter, their hearts would not see it, they just continue it. Lanken Sanga Community of the day have become just psedo monks. They abuse poor DANA for their surivival. I am a born buddhist, but I dont have a good picture about average monks in the country. Sadly the story is like that. This guy is not a monk. Let us get that staright. He is a celebrity, who has used Buddhism to charm stupid Sinhala Buddhists. Worst of all, he is a baby elephant kdinapping & abusing wildlife criminal. Please read naturalist Sajeewa Chamikara’s detailed essay in Sinhala on Dammaloka’s fake Buddhist mask. In Dammaloka’s defense though, why is only he is in hot water? How about Shashindra Raja, Namal Raja, Gota Raja, Mahiinda Raja’s BIL etc? They all had kidnapped elephants with forged docs. None of these wildlife criminals are charged yet. Looks like Ranil Mama & Sagala Boy know how to micro manage these affiars. That way one could eat the cake and keep it as well. At the same time. God bless the stupid Sri Lankan electorate. But as I heard from some women – ane hari honda hamuduruwo… how come ? I think like the pop stars sell their CD pieces, lanken monks are on the business but telling that they have been good monks. All is a business. I dont even respect any monks when getting to lanka next. They also sell old Ola (palm leaf) manuscripts to tourists. They sell even themselves not only those beach boys at west coast – so abusive as no others. Differnce remains the costume. While living in Europe, as many see them, I also notice the nature of drag queens that make every effort to live their double lives that way, – to me, some Sangayas of lanka today, do the same wearing Sanga uniforms. They have no guts to face the life as Lay people for their own complexes. This has become a psychological problem by today. Why you think he is no good ? What evidences you have in your collection to prove that.. please answer.. Thanks. Why the monks of this kind should get on with theanimals this way ? Are there no enough ones to work for the handling of Elephants ? Normally Budhdist monks should be very exemplary. Why they the lanken senior sanga bodies allow them to play with animals this way ? That is no good for the entire Sanga community. If they are to play with animals should rather go to wild parks or Zoos inthe country. What would the youth think having looked the kind of pictures. Are these Sangayas training for circuses ? I am thinking of bringing him a teddy bear so that the monk could continue play with. Ane habata mehemath nataka – Why the kind of monks make every efforts to grab attention remain unanswered to me. I dont think we have any good monks remains today that are not indulging any unwelcome moves. It is like searching for a aba from a house noone dead – the common saying reminds me right now. Tamil Diaspora will not welcome this monk. why do you think so? if he is a monk and stick to his devinely duties he is most wellcome, But if he is a buddhist fundamentalist and racist we would do our best to make his visit unforgetable. We will REMEMBER what you do. “Dhammakayo Bawang Hoti, Damma Dessi Paraabhawo”. Is he really? Then what about his pledge to the people and community to observe ‘Vas’ during this ‘Vassana Kaalaya’? Yeah of course pledges are taken to be broken? He should be lodging in one place through out the season and not jet-setting around the world. I bet he will say, “Ah well, i ma travelling by air above the clouds, no chance of getting wet”. Not surprising manipulation of words for political monks. Thrisu, these are just men hidden behind the wrappings of Sanga. For their some reasons, they have failed to face the life as lay people. May be their tendency not to work for their own living. Calling them as missernaries of Buddha, they have been doing somethhing totally different to their preachings. I listened ot the tape he added following his arrest, ” ane mama katawatha waira koranne neh… ane mama danne nehe.. thotha baba type”. But very same monks should have noticed the way the adminsitration worked for the average in this country. it was beyond all brutal standards. Some called srilanken was the small Pakistan under the guidance of Meeharaka Rajakashes. But even yesteday the Sanga wrapped SO CALLED monk added the remarks ” mehema giyoth ratama winasai… if they investigate the way they have been doing – that can destroy the country”. Real buddhist monks should stand by the current regime with their capablities – not forgetting late great SOBITHA thero. But have these monks been doing that ? During Mara years Venerable monks cant be arrested, Secretary of ministries, rapists, fraudsters,mass murderers, military intelligence. We call our country wonder of Asia. You believe or not – then venerable have turned to the VENERAL over the years. Today, almost as some commentators do report, hang on smart phone and what they call ” mal kadanaya- flirting as no other” but further depending on the DANA offered to them: Young Sangayas behaves no difference to Lay people by the way they stroll – no seelayak at all. Had my mother been there, she would have felt ” DEYYO SAKKI – Ratakata giya kala”. When Batalanada Ranil includes his mate the US Ambassador’s draft in to his Constitution, it will be all in the penal code, if it is not there already. How dare this Yahapalana SC grant permission for the Monk to go to London?.. If one is a true Buddhist one should boycott this man’s dhamma sermon. How dare he preaches to others when he was involved in the killing of a maternal elephant to separate the baby and then be party to selling these poor animals. Punishment, I had thought that is promotional to the weight of the offence. Law enforcement authorities it appears have gone bit too far to satisfy Yahapalana masters. What is the proportion of Budhist monks on bail in relation to proportion of Hindu monks in Sri Lanka ? 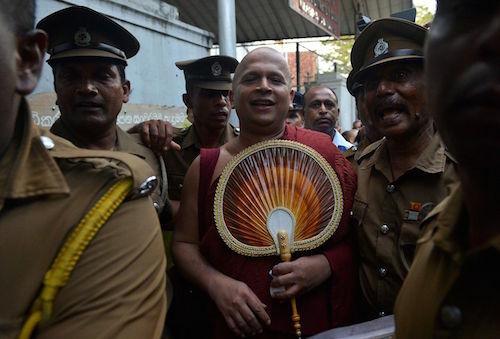 Why do I always read that monks getting arrested often in Sri Lanka. Is the media biased against Budhist monk? Is there any other factor ? Or Budhist monks are inherently criminal in nature in general ? I am just curious why are those monks often getting arrested or implicated in crimes ? There is “Awakening” to the teachings of Gauthama Buddha in the West and in the whole world. If this type of “Sangha” (Disciple of Buddha)decides to preach that Great Teaching to the world, we could imagine what could happen to that “Awakening”. If this so called Rev. has an atom of “shame” and “guilty consciousness”, he would definitely refrain from undertaking of these types of missions; instead he should seriously contemplate on his FAILINGS and WEAKNESSES and try hard to REFORM and REGAIN his lost character. Where are his “DAYAKAYAS” and WHO are they? Where is that DHAMMA DEEPA?. What a TRAGEDY? This guy is going to spoil some of the good work being done by Dhamma Duta Sanghas in London. They will be tainted by the lies of this politicians, so that people will not trust even what Lord Buddha taught, coming to us through genuine teachers. How does a man out on bail get a British visa? Is there no limit to yahapalana’s power? The Hatred and the Venom displayed by the Yahapalana suckers towards Srilnakan Sangha which is on display here, are unbelievable. Even Sinhala Suckers are there ,who say they are Buddhists but denigrate Sangha, because these monks don’t tow Batalanada Ranil’Yahapalana Politics to destroy Sinhala Buddhist influence. Bodhi Sira’s mouth piece and the body guard, Minister Rajitha said yesterday that he was elected by the good Muslims in Beruwala. He held a meet in Beruwala to thank them ,and appoint a one Majid as his main organizer.r. And Rajitha assured the Muslims there , that non of the JO members will be in the next Parliament. That is the whole caboodle of the Sinhala Buddhist great majority representation in current Parliament. Is it the Magic of Batalanada Ranil’s new Constitution, which is being worked on like a Stealth Bomber from the States, which is going to annihilate the voice of 6 Million inhabitants who are the Sinhala Buddhists?. We all know that expunging Buddhism from the Constitution is one of the main core items in Btalanada and Mangalana’s Agenda. We don’t need to be Political Students to understand that. Mahasangha , specially charismatic and popular Sangha like this Monk are the only protection the great majority has to safe guard their 2500 year old nation. Is it a surprise then that Batalanada Ranil is going for their jugular?. May Bodhi Sira attain Nirvana. That is all our Upakasa Ammes and their Upasaka Husbands in the village can say after Batalanada Ranil brings in his new Constitution. Don’t underestimate the craft of the priest. Priescraftry is has been honed and sharpened over the years. There are any number of gullible people in the world who are so easily mesmerised by crafty priest. It is a good job. Well paying. Easy living. In the west the churches are becoming emptier and emptier as people are becoming better educated. But in the third world country especially Sri Lanka the crafty priests of all kinds are able to draw the gullible faithful in their drones. No point singling out Dhammaloka. All priests are Lokoththarayas. NO one talked about Kasippu Joseph. Baby is going to London town? Let him ride on his elepant. I hope they woud not piss on the buggers below! Dhammaloka has no right to wear the Buddhas revered robe as he is a damn liar. He is supposed to observe DASASIL. As he has lied in regard to the baby elephant he got from Gota. He said that the baby elephant was fond in his temple abandoned by somebody.Bloody rascal. Fellows like this are a shame we Buddhists. I must tell this rouge KA Sumanasekera to go and fly a kite.